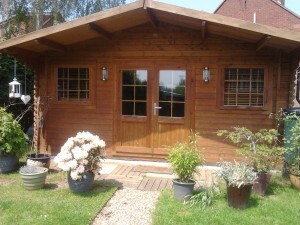 In the Log Cabin is a unique and relaxing Pilates studio in St Albans, a place for you to take some time for yourself and your body. 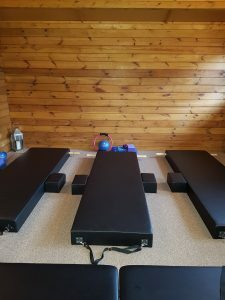 In the Log Cabin provides the perfect setting for our Pilates classes and Baby Massage classes with its cozy and friendly atmosphere. 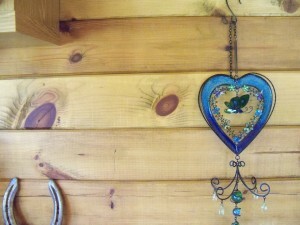 Everyone who visits the log cabin falls in love with it! In summer it is surrounded by beautiful flowers, and birds can be heard singing in the nearby trees. The garden is well kept and if you are lucky you may be able to sample some of the home-grown veg! Once inside our it is easy to forget about the outside world; your troubles are left at the door while you concentrate on you for an hour. You may notice little charms and ornaments like the horse shoe bringing everyone good fortune or the little candle-lit lanterns to bring a warm glow in winter. The studio has lots of lighting options from spot lights to soft lighting depending on which the clients prefer. There are also lights outside so you can find your way on those dark winter evenings. 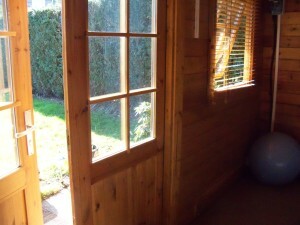 The studio is heated as there is nothing worse than trying to exercise with cold muscles and in the summer the windows and doors can be opened to let in the lovely sunshine. When you arrive for your session, you may park on the drive. There is plenty of room for up to approximately six cars. 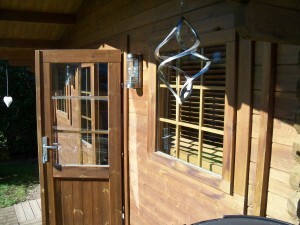 Please come round to the side gate where you will find a gravel pathway leading up to the log cabin studio. Clare will be waiting for you inside where you can remove shoes, coats, etc before beginning your session.